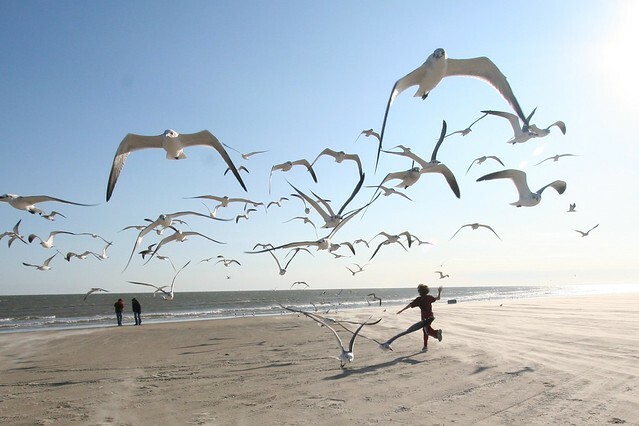 running with the seagulls | Flickr - Photo Sharing! Update2: please vote for this photo on JPG if you are a member over there. Thanks! Well now, who knew. This one is definitely the most popular photo in my photo stream. Thanks y'all! - update: I also submitted this one to the Musee de L'Elysee as shown here. Update: Thanks to the Wallpaper and Backgrounds group for making this the Wallpaper of the Month! Very cool! Update: Sadly this photo was stolen and used without attribution on the book Houston Quick Escapes. I emailed the author and publisher and was told basically "bummer, go after the guy who stole it and sold it to us." Nice. Apparently theft is profitable even if a photo is Creative Commons. Sheesh. Erci, Boudewijn Boer (Bo), Ernie :+), and 755 other people added this photo to their favorites. Dieses Bild ist wirklich ein Abenteuer für die Augen. This picture is really an adventure for the eyes. a true artist has his or her work stolen ..
Seen in Tall Tails of Animals. You know, I like this photo so much I immediately recognized it when I saw it used for a real estate listing. Here's the link: www.har.com/13215-binnacle-way/sale_70934454 Second to last photo. If for any reason you would prefer not to have it used on our site, just let me know and I'll take it down. You can reach me at editor@thevindicator.com.